The Easter 2006 Rally was held at Coalport Youth Hostel in Ironbridge, Shropshire, one of two Youth Hostels in Ironbridge (the other is Coalbrookdale). 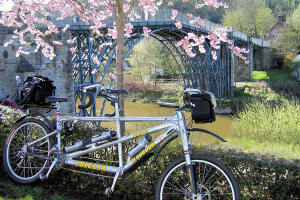 Ironbridge is the birthplace of the industrial revolution and has no less than nine museums in the valley. The surrounding countryside generally consists of rolling hills (one or two steeper places) and small networks of lanes, offering excellent cycling opportunities. There are many places of historical interest (National Trust and the English Heritage both well represented) within easy cycling distance. The Tandem Club booked the hostel for 60 beds from Good Friday to Easter Monday. Two ride routes were arranged for each day (Friday through to Monday) of about 30 miles and 40 miles. Places and points of interest were highlighted in the excellent route sheets and maps were also provided for each ride. The club AGM was held on the Saturday Evening. There was a Treasure Hunt on Sunday with prizes being awarded following the evening meal.